Through three rounds, we have gone 10/14 in series predictions. Two of these incorrect picks have come from series involving the Cavaliers. As we have seen in prior years, our models have a hard time assessing the Cleveland Cavaliers because they consistently under perform in the regular season. In the Championship round, our models are siding with the Golden State Warriors. 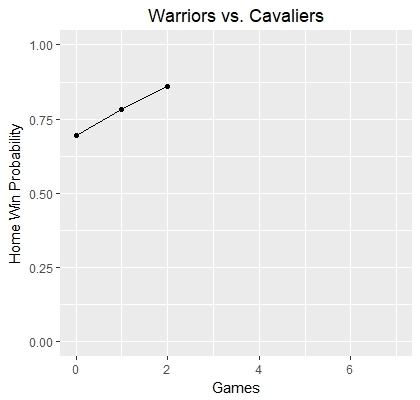 Four of our five models picked the Warriors to win, and the average probability across the five predictions is 0.69. We will continue to update the table below following each game in the series! The probabilities for our series predictions from the first three rounds are generated from four unique statistical models that are built on team and player level data from the regular season. For the NBA Finals I added a fifth model built solely off of data from the post season. The final prediction for each series comes from computing the average of the outputs from each model. For more information on our modeling techniques check out our methodologies page.